LOS ANGELES (AP) — Winless UCLA wants to be where No. 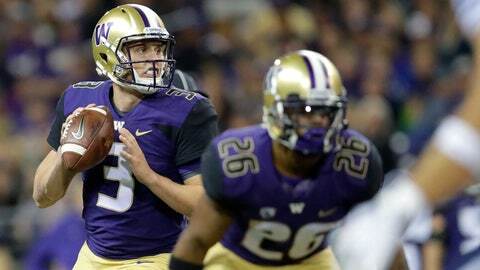 10 Washington is, contending for Pac-12 titles and berths in the College Football Playoff. Though finding their breakthrough victory against the Huskies on Saturday night might be like the longest of long shots, the Bruins seem to have the right attitude necessary to achieve their long-term goal. UCLA (0-4, 0-1 Pac-12) is in the first year of rebuilding under coach Chip Kelly, but Washington (4-1, 2-0) will provide a firsthand example that such reclamation projects can produce results. The Huskies went from a mediocre 15-11 record in coach Chris Petersen’s first two seasons in charge to winning the conference and appearing in the CFP semifinal at the Peach Bowl in his third season. The commitment to make such a turnaround happen can be trying, Petersen said, but requires complete buy-in. “You just got to stick to your script,” Petersen said. “Everybody has their way of what it’s going to look like, and there are hard decisions along the way. Sometimes you got to just keep recruiting your guys to get in. It can be hard on guys you didn’t recruit because things are a little bit different than how they were recruited in. Kelly, who never lost consecutive games in the same season during his four seasons as the head coach at Oregon, does not appear to be deviating from his approach while going through the longest stretch of his college career without a win. Practices dictate playing time in games, as redshirt junior Joshua Kelley showed in a 38-16 loss at Colorado. The transfer from UC Davis turned a strong performance during UCLA’s open week into 124 yards rushing on 12 carries against the Buffaloes. “It’s who has consistently been doing what he needs to do, so that’s a credit to Josh because he didn’t play very much against Fresno but instead of sulking and hanging his head, he went out and went to work and those last two weeks, he rose above those guys,” Kelly said. GAINS VS. GAINES: UCLA rushed for a season-high 151 yards against Colorado, but building on that success will be difficult against a Washington run defense led by senior tackle Greg Gaines that is allowing 3.59 yards per carry. “In that game, I felt like every time we ran the ball it felt like there were holes. I think we were moving our guys, and it’s just a good feeling,” UCLA left guard Michael Alves said. BROWNING CLIMBING: Huskies senior quarterback Jake Browning needs two touchdown passes to tie Southern California’s Cody Kessler (88) for seventh-most in Pac-12 history. Browning will likely pass Arizona State quarterbacks Andrew Walter and Rudy Carpenter for 13th place for career yards passing in the conference’s record books, needing 146 yards to jump ahead of the two Sun Devils. FRESHMAN FOCUS: Freshman quarterback Dorian Thompson-Robinson is expected to make his fourth consecutive start for the Bruins, having completed 58 of 110 passes for 660 yards with three touchdowns and two interceptions since replacing Wilton Speight in the season opener against Cincinnati because of injury. While Thompson-Robinson might be the face of UCLA football for years to come, Petersen believes relying on a first-year quarterback to set the tone for a program in transition might be too much to ask, pointing to his own experience when Browning started as a freshman in Petersen’s second season at Washington. “His freshman year, all you’re trying to do is do your job and stay one step ahead of what you’re learning that day,” Petersen said. BEST OF THE BEST: Kelly, Petersen, and Ohio State’s Urban Meyer are the only active coaches to have won at least 80 percent of their games with at least four seasons in the FBS. Petersen has a record of 133-30 in 13 seasons at Boise State and Washington, and Kelly is 46-11 in five seasons at Oregon and UCLA. However, Kelly’s career winning percentage would drop to 79.3 if UCLA loses to Washington.